American films of the early 1910s look quite different from those of the end of the decade. 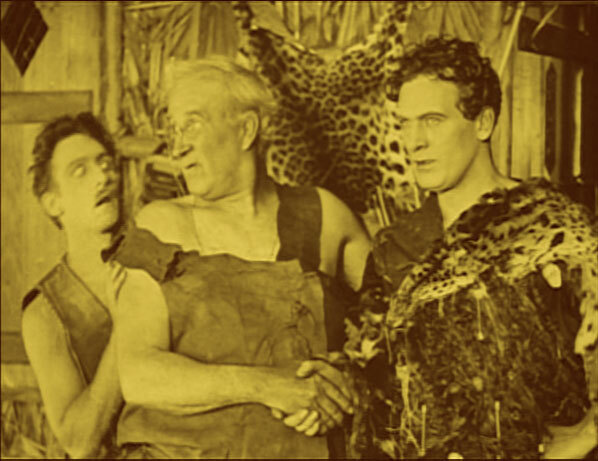 Take, for example, the following two clips, both from comedies of the 1910s. The first is from Alkali Ike's Auto, a one-reel film from 1911 starring Augustus Carney, and the second is from Get Out and Get Under, a 1920 two-reeler starring Harold Lloyd. 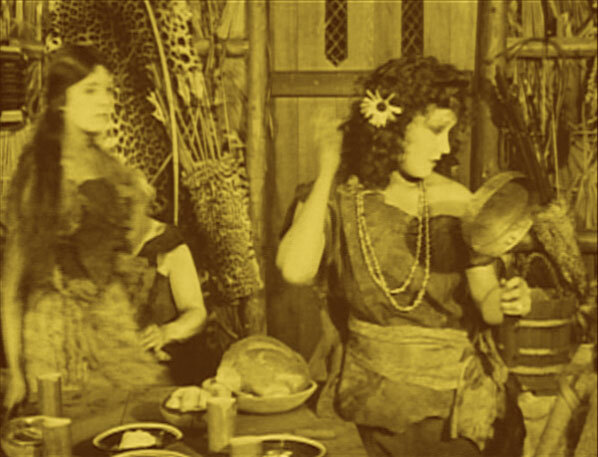 The 1910s were a time of technological and stylistic experimentation and innovation for filmmakers. During this time, cinema matured as an artistic medium and as a mode of popular storytelling. Following is a brief overview of some of these major transformations in film style. The earliest films were shot outdoors or in studios designed to let in large amounts of sunlight (see figure 1). Filmmakers soon began to supplement natural with artificial light (often stands of carbon arcs) in order to achieve more sophisticated effects and more control over the look of the film image. Over the course of the 1910s, many studios moved to shooting almost entirely with artificial light. Variations of "three-point lighting," the technique of using a strong key light and a weaker fill at the front or sides of a subject, and one or two backlights behind, were soon standardized (see figure 2). In the United States, staging in depth—presenting action on multiple planes, rather than just the one closest to the camera—was not the norm. However, this practice was more common in Europe, where sets were sometimes built to accommodate background action (e.g., through a wide doorway revealing another room at back of the set). Through the early 1910s, performers frequently faced and even directly addressed the camera. As more "naturalistic" acting became the norm, this mode of direct address became less common in most genres. 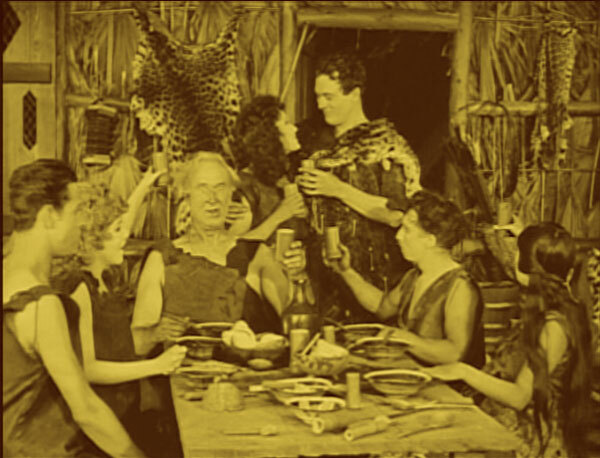 The earliest filmmakers typically placed their subjects relatively far from the camera, creating distinctive distant framings that included actors' entire bodies, often with a large amount of headroom (see figure 3). 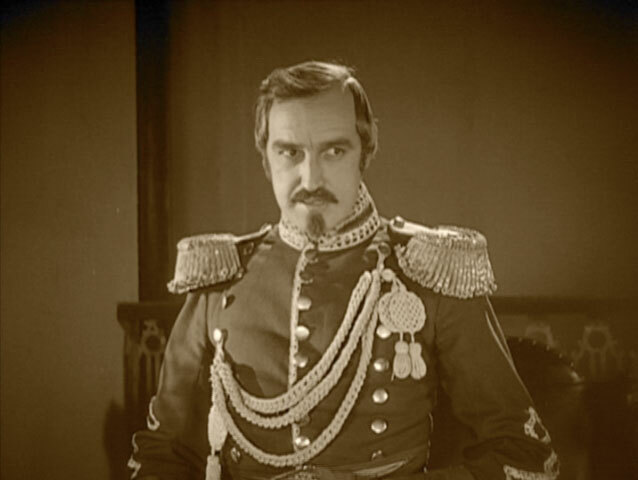 Framings grew closer throughout the first and second decades of the 1900s, with many filmmakers settling on keeping the performers between nine and twelve feet away from the camera, the closest they could get without losing focus in the foreground. With standard camera lenses, this range created head-to-knee to head-to-ankle framings (see figure 4). The use of close views, whether of actors' faces or of significant objects like letters, became increasingly common in the '00s and '10s and played a key role in the development of the classical continuity editing system, discussed below (see figure 5). Camera movements were not widespread in films of the 1910s, especially for indoor scenes. But the iris shot, which isolates a visual element with a circular mask that was opened or closed by a device installed at the front of the camera lens, was among the most popular items in a cameraman's toolbox in the 1910s (see figure 6). The iris, along with stationary masks, could serve a variety of expressive and decorative functions (see figure 7). The 1910s also saw the innovation of matte shots, which allowed the relatively seamless combination of two different settings into one shot. Filmmakers have long conceived of "the shot" as the basic unit of films. But this was not always the case. Prior to, and during much of, the 1910s, directors and screenwriters organized their work by what they called "scenes," which referred to uninterrupted action filmed by the camera from one position. This idea assumed that a scene (in the familiar sense of the term, i.e., a segment of the story, usually taking place in one location) would be filmed and presented in a single take, perhaps with an insert or close-up added if necessary. 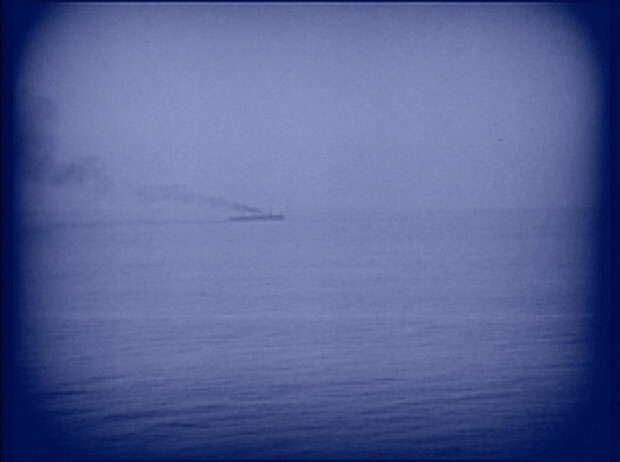 As a result, there is relatively little editing in early films. During the 1910s, the notion of one scene in the story as equivalent to one "scene" (in the sense of a "take") began to erode. Directors and screenwriters explored the possibilities of scene dissection. This means breaking a story event in one location into many shots, so that a single scene might contain: distant views that showed the entire space (establishing shots), medium-scale views of each important character, close-ups of faces and objects, cuts motivated by a character's glance (eyeline matches), shots mimicking a character's point-of-view, and cuts during characters' movements to allow smooth transitions to different spaces and/or vantage points. For examples, look at figures 8-14, all from a scene in Cecil B. DeMille's Male or Female. D.W. Griffith, who began directing at the Biograph studio in 1908, made numerous contributions to the development of editing techniques in the United States. 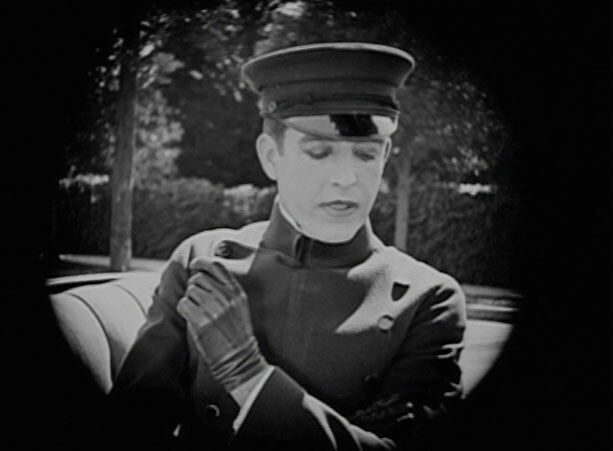 But he by no means deserves all the credit, and in fact, his films of the 1910s look quite different from those at the vanguard of the emerging system of continuity editing. Griffith did popularize parallel editing, which presents alternating views of two lines of action (e.g., a trapped woman and the hero racing to her rescue). But he showed relatively little interest in many of the other forms of analytical editing that dominated filmmaking in the United States by the late 1910s. The scripts in the Aitken Collection can shed light on many of these stylistic transformations, particularly those related to editing, in a way not necessarily apparent from films themselves. Because they allow us to see, in words, how scenes were originally constructed, they document the changing ways that scenarists, editors, and other personnel conceived of telling stories, building drama, and articulating spaces through the numerous new techniques making their way into filmmakers' toolboxes. Bordwell, David. On the History of Film Style. Cambridge: Harvard University Press, 1997. Elsaesser, Thomas, ed. Early Cinema: Space, Frame, Narrative. London: British Film Institute Publishing, 1990. Gunning, Tom. D.W. Griffith and the Origins of American Narrative Film: The Early Years at Biograph. Urbana: University of Illinois Books, 1994. Salt, Barry. Film Style & Technology: History & Analysis. 2nd ed. London: Starword, 2003.